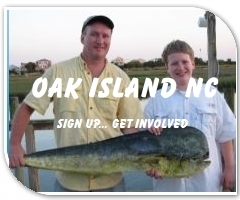 Welcome to Oak Island NC! Our island home is one of the last beautiful beaches on the North Carolina coast, that is not commercialized... YET! Please sign up and get involved in your community. Each week we will pick a business, You tell us if its a great place to visit or avoid! Be honest and try not to bash anyone after on simple mistake. Remember, most of the time it is NOT the owner of a business that caused conflicts. Give the owner a chance to make good. "Treat others, as you would like to be treated". We will be offering a calendar and bulletin board for you to sell your items. This will be free as long as I can let it go. If you want your business here on this site, we will advertise it by contacting Steve. Items For Sale! Sell Your Items! List your rentals and your autos! FREE for a limited time! Calendar of Local events. Send in your request for dates and events to be added. Please feel free to sign our guestbook! Let us know where you came from! These blogs are designed to get the community into action about certain subjects... please feel free to request new subjects.